SNP councillor Kirsteen Currie spoke out on the issue. Police and politicians have condemned the “deliberate” scattering of tacks across part of the popular NC500 route as “irresponsible” and “potentially deadly”. There have been four occasions in the last eight months where roofing tacks were found strewn over a road near Bettyhill in Sutherland – the most recent in the last week. It is feared the criminal act is being carried out by a frustrated local who is angry at the increase in traffic following the introduction of the popular tourist route in 2015 – and the behaviour, particularly speeding, of some drivers. 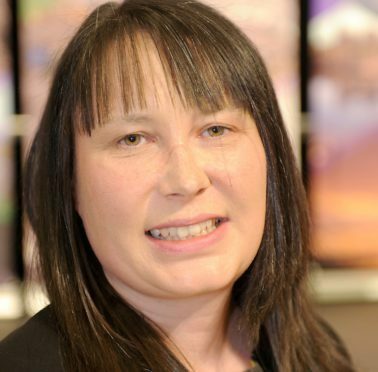 SNP councillor Kirsteen Currie, who represents the north, west and central Sutherland ward, said: “A lot of residents are frustrated with the volume of traffic, with many whizzing passed their homes, since NC500 began. “I understand that frustration, but I am concerned that people are not dealing with it in the right way and are taking the law into their own hands. Caithness councillor Matthew Reiss, Highland Council’s strategic lead for police, said: “If someone suffers a blow out it could result in a crash with serious injury – or worse. Highlands and Islands Regional MSP and road safety campaigner David Stewart added: “Deliberately leaving tacks on the road surface to cause damage to vehicles is totally irresponsible and could lead to a serious road collision. “Punctured tyres on any road vehicle, motor cycle or pedal cycle could cause that vehicle or cycle to go out of control and be a danger to all on that road at that time. The tacks were repeatedly found at the junction of the A836 between Bettyhill and Strathy with the unclassified Kirtomy road. It was first reported in February and twice more in April and May. The most recent was within the last week. The incidents have occurred predominantly late in the evening. Constable Katy Hunter said: “Deliberately leaving tacks on the road is clearly and irresponsible act which creates a hazard for all road users. Last month 85 vehicles were stopped by police along the scenic NC500 route in one day. Officers issued cautions to 45 motorists, with 12 reported to the procurator fiscal – seven of those in relation to speeding offences. Tacks have been used in a bid to sabotage a number of cycling events across Scotland in recent years. The protest tactic is understood to be carried out by people angry at road closures and diversions being put in place for such events. Metal tacks were found on the route of last year’s Pedal for Scotland charity event between Edinburgh and Glasgow – resulting in hundreds of burst tyres. The same event in 2015 also saw tacks and nails placed on the route, with about 50 riders sustaining punctured tyres. The Etape Caledonia cycle race in Highland Perthshire has also been targeted, with tacks and drawing pins being placed on the route in 2009 and 2011. There was a serious crash following the 2009 event, and a community council chairman was charged with sabotage. But the Crown later dropped the case, giving no explanation, and police said at the time they had no plans to charge anyone else.